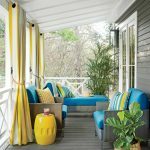 Who can resist a cute California cottage?! 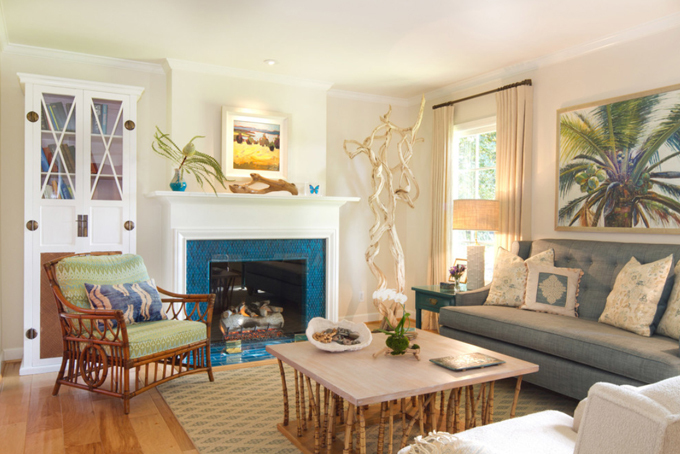 Interior designer Charmean Neithart out of Pasadena gave the homeowners of this 1700 sq foot home photographed here by Erika Bierman exactly what they wanted: a beachy vibe while making the most of their limited space. 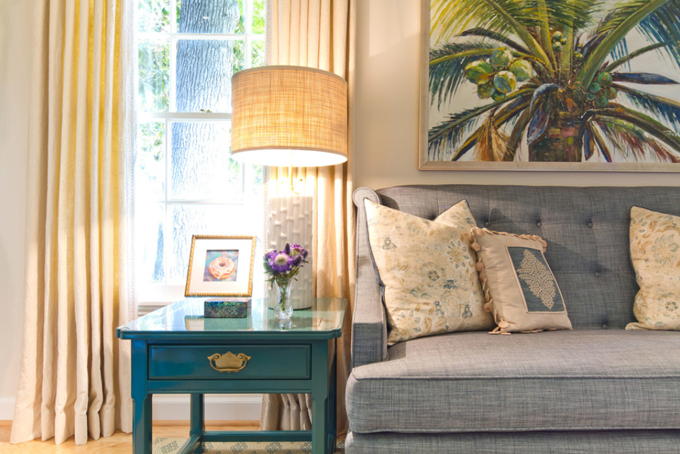 Such a lovely mix of natural texture, color and pattern! 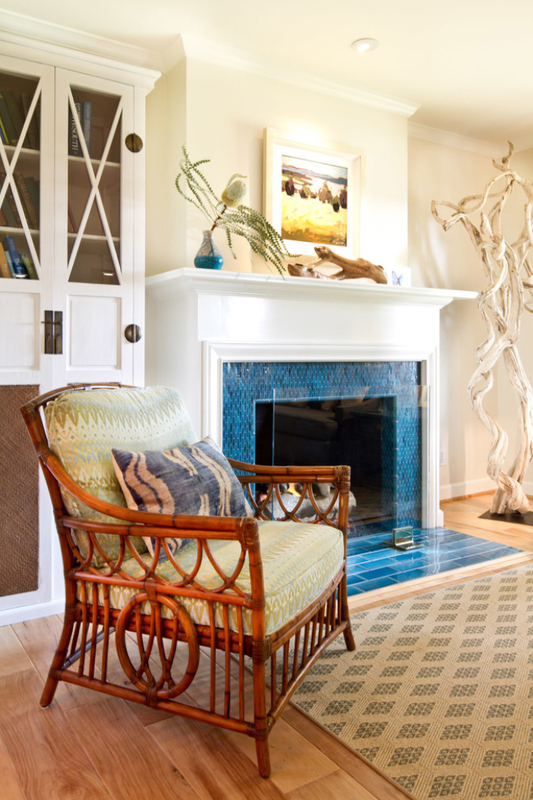 Seriously, how cool is that fireplace?! 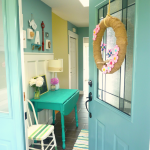 And I’ve never met a turquoise door that I didn’t love! 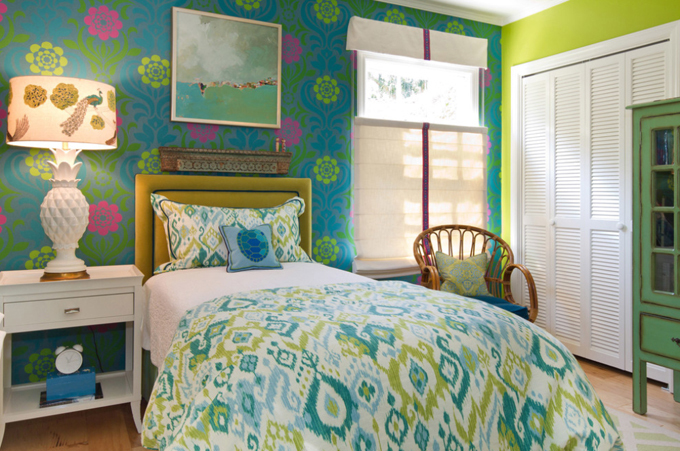 (This one is painted ﻿Florida Keys 2050-40 by Benjamin Moore.) 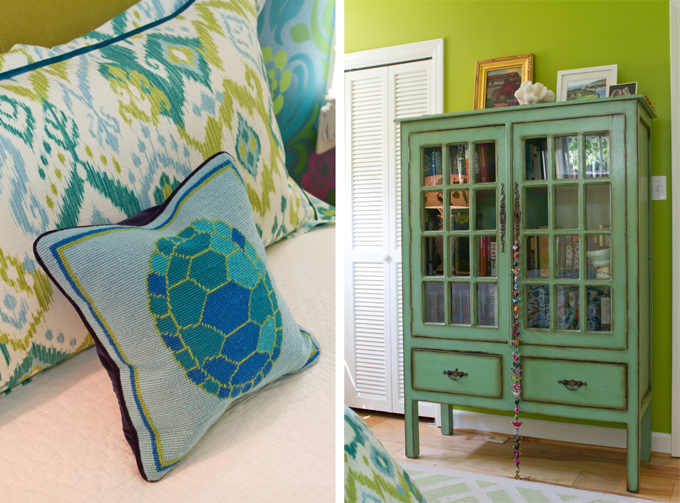 There’s more to see of the home, so head here next! 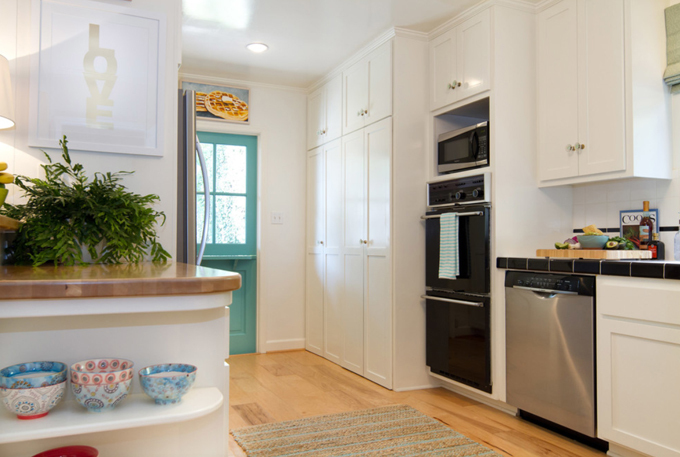 And if you love cottage kitchens (and turquoise ceilings! 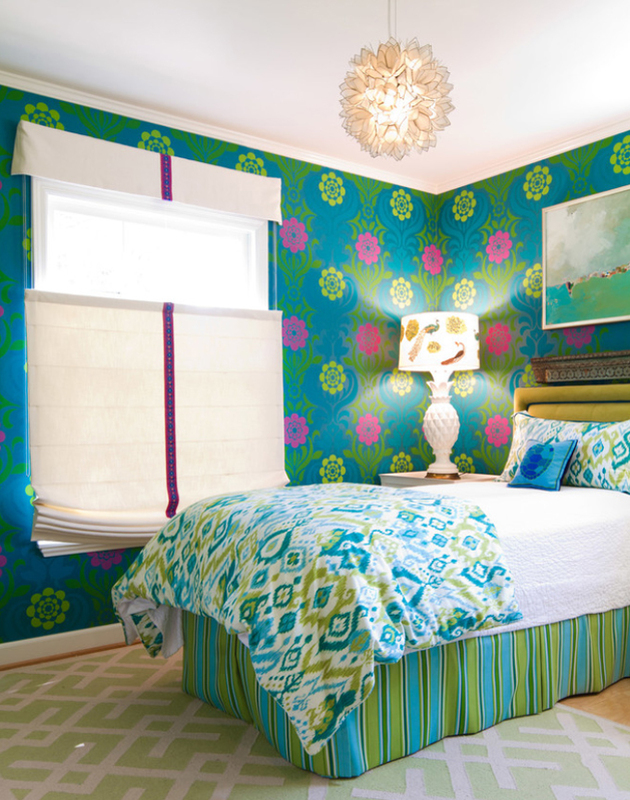 ), check out this other space Charmean designed here that I featured a while back! Wow! This is so amazing. Love the designs and color. The insert on that fireplace is magical!!! Love it. 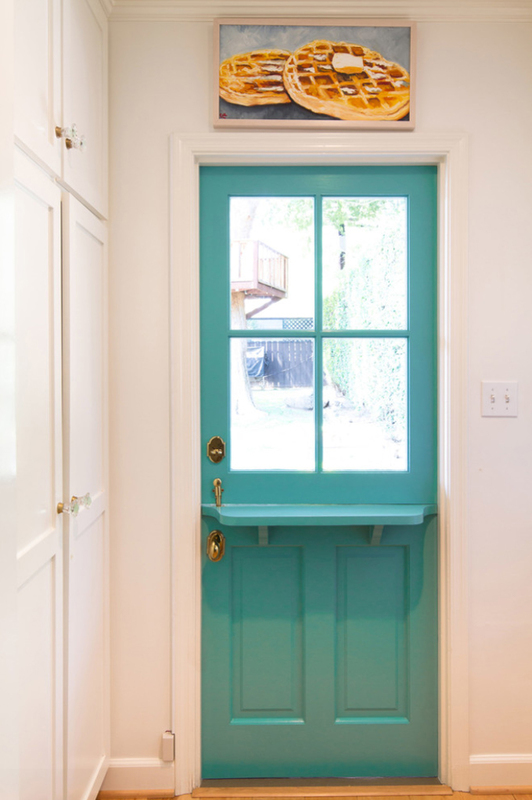 And the Dutch door is so dreamy. 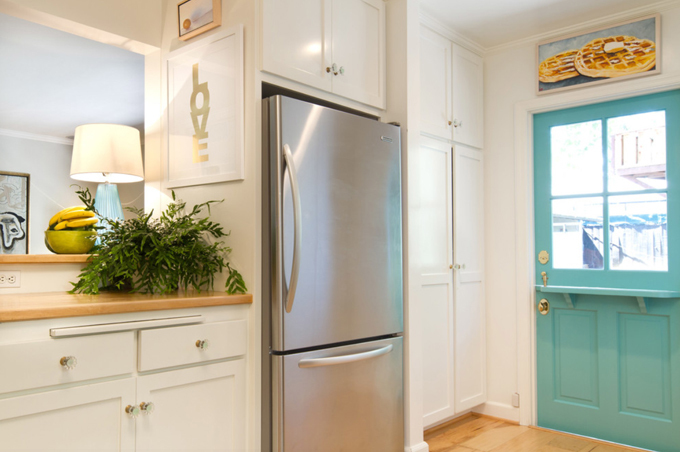 I wish my kitchen allowed for a Dutch door. They just rock. 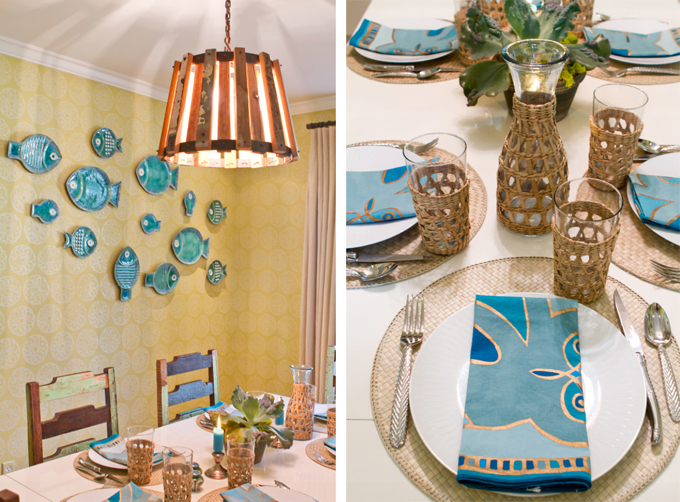 Thanks, once again, Erin, for finding another beautiful home to help me dream in color! 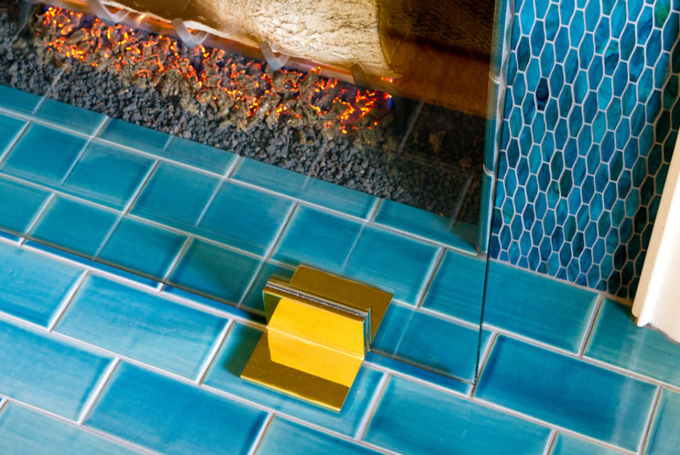 Amazing fireplace tile and how can you not love a Dutch door. I don't think they are probably all that practical in my neck of the woods, but you can't get much more charming than that. 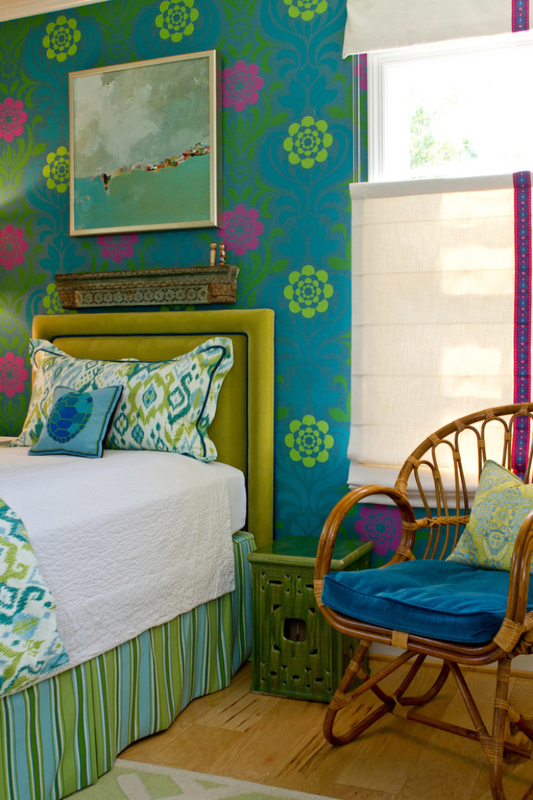 LOVE that bedroom wallpaper!!! So funky and fresh. 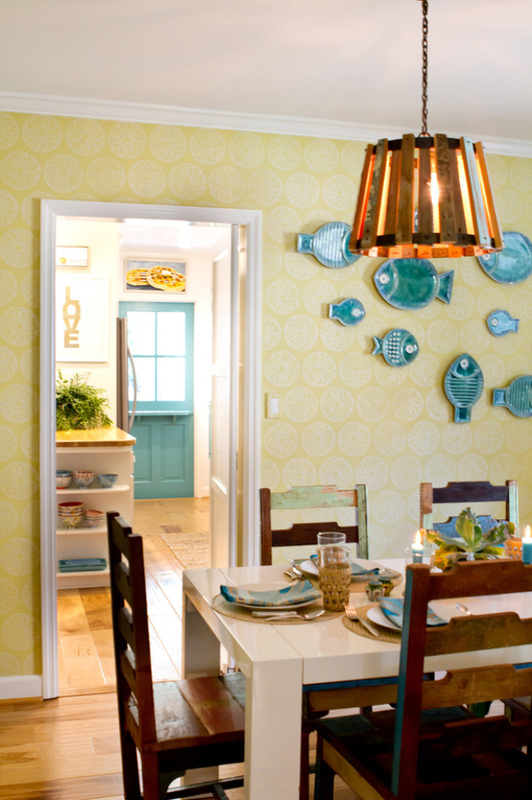 I love the fish platter wall. 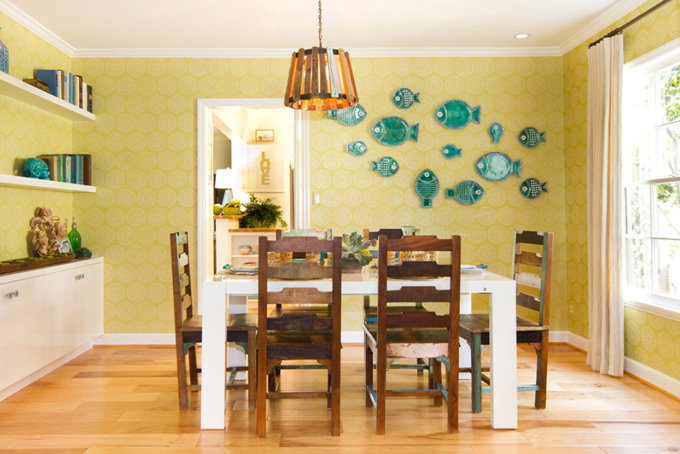 There are so many lovely fish plates & platters available..I am thinking a school of fish on the wall is a good idea! Such serendipity! I putting together a pinterest board on peacock blue for my laundry room. And I'm trying to find the perfect shade to paint the door in the room. 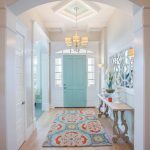 While looking back at an image I pinned of turquoise & coral I headed over to your blog (which I love by the way!) and came across the perfect shade for the door! Thank you!! 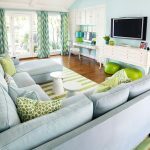 Just goes to show what colour can do for a home's vibe. 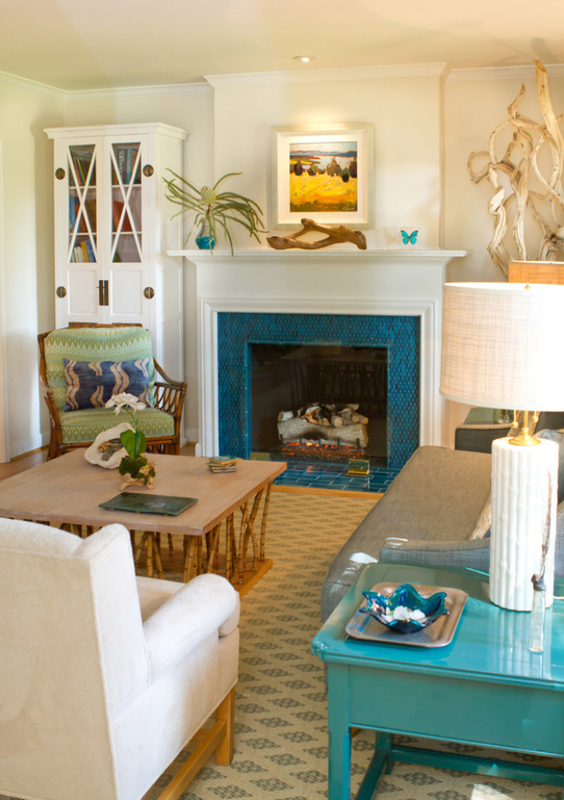 It would make me feel alive and happy to live in a home decorated like this. So tropical. Would probably suit my Aussie lifestyle. What a cheerful house! I just don't think you could possibly be in a bad mood or have bad day there. So cute! Wow-this is my friend's house and as amazing as the pictures look, the house looks even more amazing in person! 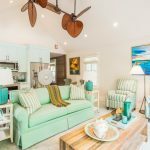 The house is warm and inviting and has an incredible vibe which instantly puts me in "relax mode" as soon as I walk through the door (perhaps it is the coral, fish, rattan which makes me feel that I'm at a fancy beach resort?) Love it!